Some life insurance proceeds may be community property. 2. Do We Have to Probate for Life Insurance Proceeds in the State of Michigan? 3. Are Life Insurance Beneficiary Rewards Taxable? In a divorce, Idaho courts divide the community, or marital, property in a manner fair to both spouses. In Idaho, proceeds of an insurance policy may or may not be community property. Characterization of the proceeds depend heavily on the type of insurance policy at issue, as well as how and when the policy was paid for. 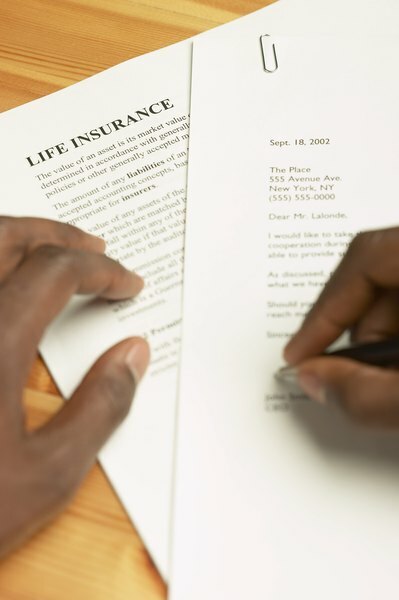 There are two basic types of life insurance, and they operate differently. Whole life insurance acts as both life insurance and as a way for the policyholder to save up money. The policyholder pays regular premiums, and although the policyholder can choose beneficiaries in the event that he dies, he also has the right to cash out the policy for the value he's put in during his lifetime. By contrast, term life insurance means a policy that operates for only a fixed term, or period of time. Only the beneficiaries of the policy have the right to receive the proceeds, and they can do so only after the policyholder has died. In an Idaho divorce, courts decide whether each item of the spouses' property belongs to the community (the marriage), or to one individual spouse. Items found to be community property are divided fairly, if not always equally, between the spouses. To decide whether property belongs to the community as opposed to one of the separate spouses, Idaho law looks at whether community or separate money was used to pay for the property. In the case of a possession involving multiple payments, the court also considers whether the bulk of the payments were made before, during or after the actual period of the marriage. In the case of a whole life insurance policy, in which multiple payments accrue over time, the court looks at where the money for the premium payments came from. If some or all of the payments were made with community funds -- for instance, from a bank account held jointly by the spouses -- the court will often rule that the portion of the proceeds proportional to the community's portion of the premiums is community property. But if most of the premiums were paid by the separate property of one spouse, that percentage of the proceeds will also be the separate property of that spouse. Characterization of term life insurance proceeds is very different in Idaho. Because term life does not accrue value -- it has no value until the insured individual dies -- Idaho law is really interested in only the last premium payment before the death of the policyholder. If that last payment came from community funds, the entire value of the proceeds belongs to the community, and is subject to division in divorce. But if the last payment came from the policyholder's separate funds, all proceeds are considered her separate property. If the term life policyholder has not yet died at the time of divorce, the court will generally leave the policy alone, since it has no current value.